Amazon has got a nice deal on this 23 oz. 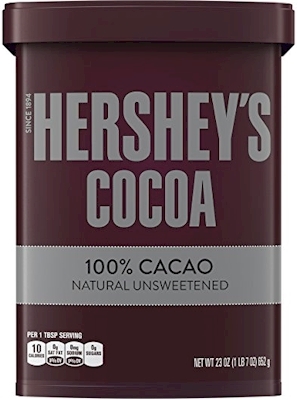 Hershey's Unsweetened Cocoa, which, according to the OU, is kosher for Passover without any special Pesach certification (see page 62 in the 2017 OU Pesach Guide), as low as $7.77 with free shipping with this Subscribe and Save deal (34 cents per ounce). If you're buying this specifically for Pesach, make sure you adjust the Subscribe & Save shipment date so that this arrives before April 10th. $7.77 ($0.34 per oz.) with the Subscribe & Save 15% discount (if you can take delivery of 5 or more active subscriptions in one month) . $8.68 ($0.38 per oz.) with the standard Subscribe & Save 5% discount. BTW, just for price comparison purposes, the 7 oz. 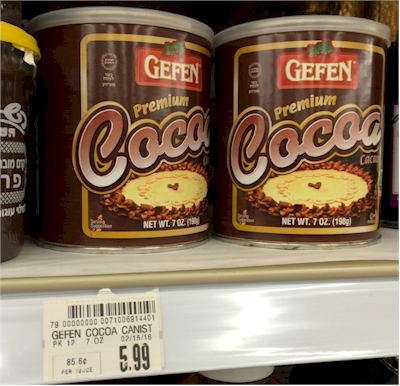 Gefen Cocoa (kosher for Passover) at our Kroger affiliate supermarket is $5.99 or 86 cents per oz., which is, ounce for ounce more than twice the Amazon price on the Hershey's cocoa.